South China Sea claimant states have begun pushing back against China’s assertiveness. On March 18, officials from China and the Association of Southeast Asian Nations (ASEAN) met in Singapore to resume consultations on a Code of Conduct in the South China Sea that began last September. This meeting should have created an atmosphere for the lowering of tensions in the South China Sea. At the least, China and the ASEAN claimant states could have been expected to avoid provocations while the consultations were progressing. Just the opposite occurred. Nine days before the ASEAN-China discussions commenced, Chinese Coast Guard vessels stationed at Second Thomas Shoal took the unprecedented action of blocking routine resupply for Philippine Marines stationed at the shoal. At the end of March, as the deadline approached for the Philippines to submit its memorial to the United Nations Arbitral Tribunal set up to hear Philippine claims regarding its maritime entitlements under the UN Convention of the Law of the Sea (UNCLOS), China unleashed a shrill diplomatic attack on the Philippines. In the midst of these developments, South China Sea claimant states began to push back against China’s assertiveness. Indonesia and the Philippines both took steps to shore up their maritime defense forces against future contingencies in the South China Sea. Vietnam pressed China for compensation for harassing its fishermen in disputed waters around the Paracel Islands while quietly taking delivery of its second Kilo-class submarine. On March 9, two Chinese Coast Guard ships stationed at Second Thomas Shoal (known as Ayungin shoal in the Philippines and Ren’ai Reef in China) intercepted two Philippine-flagged civilian vessels making a routine resupply run to the shoal and ordered them to return to port. The vessels were carrying supplies to Philippine Marines deployed at the shoal on the BRP Sierra Madre, a beached LST still in commission in the Philippine Navy. This was first time Chinese ships had physically interfered in this manner. China’s Foreign Ministry accused the Philippines of attempting to build structures on Second Thomas Shoal in violation of the 2002 Declaration on Conduct of Parties in the South China Sea (DOC). This accusation ignored the fact that the Philippines had occupied Second Thomas Shoal three years before the DOC was issued. The Philippines then resorted to airdrops to resupply the Marines. On March 29, the Philippines mounted a second resupply effort by sea. The Philippine supply vessel was once again challenged by two Coast Guard ships who ordered it to “stop all” illegal activities. The resupply vessel outwitted the Chinese ships by sailing through waters too shallow for them to follow. This turn of events led a Chinese Foreign Ministry spokesperson to accuse the Philippines of illegally occupying Chinese territory. As of this writing, the standoff continues and it remains to be seen if China will reinforce its presence at Second Thomas Shoal and adopt even more aggressive tactics to prevent future Philippine resupply efforts. China may be constrained, however, by the impending visit of President Barack Obama to the Philippines in April. On March 30, the Philippines submitted its memorial to the UN Arbitral Tribunal outlining its case for a determination of its maritime entitlements under international law. The Philippines’ memorial comprised 10 volumes running to more than 4,000 pages. The Philippine claim, initially filed in January, was amended to include Ayungin Shoal in light of China’s actions in blocking supply. The Philippines made its submission despite intense pressure by China on the Philippines to drop its claim and resume direct bilateral negotiations. Immediately prior to the Philippines’ submission, a Chinese Foreign Ministry spokesperson publicly called on the Philippines “to stop its wrongdoing” and withdraw from arbitral proceedings. The spokesperson also declared that China “will neither accept the unilateral action of the Philippines nor be present in the international arbitration.” This refrain was repeated by other Chinese officials. On March 30, China’s Foreign Ministry called on the Philippines to honor their commitments under the DOC “and return to the correct path of bilateral talks in resolving disputes.” The following day the Foreign Ministry summoned Erlinda Basilo, the Philippine Ambassador to China, to receive a “solemn representation” from Vice Foreign Minister Liu Zhenmin. Liu noted that China was “extremely dissatisfied and resolutely opposed” to the international arbitration. In late February, it became apparent that Indonesian defense officials were growing increasingly concerned about Chinese assertiveness in the South China Sea and the implications this held for the island archipelago. Since Natuna is strategically located, the increase of its forces at sea, on the ground, and in the air is necessary to anticipate any instability in the South China Sea and serve as an early warning system for Indonesia and the TNI. General Moeldoko announcement carried special weight because it came immediately after he returned from a visit to China where he reaffirmed Indonesia’s neutrality in maritime territorial disputes. In late March, Indonesia hosted the inaugural Komodo Multilateral Naval Exercise involving seventeen countries including ASEAN members and dialogue partners. The Komodo exercises will take place in the waters around Riau province, including Natuna. The exercise will focus on naval capabilities in disaster relief, but we will also pay attention to the aggressive stance of the Chinese government by entering the Natuna area. We want to explain that our laws stipulate that Natuna is part of Indonesia. Meanwhile, on March 16, in the midst of deteriorating relations with China, Philippine President Benigno Aquino announced in a speech during graduation ceremonies at the Philippines Military Academy new arms procurements totaling $670 million. On March 24, the Vietnamese newspaper Thanh Nien reported that Vietnam had requested the Chinese government to investigate allegations of assaults on Vietnamese fishermen by paramilitary state vessels in the waters surrounding the Paracel Islands. Further, Vietnam demanded compensation for the loss of equipment and fish. In addition, Vietnam’s acquisition of conventional Kilo (Varshavyanka-class) submarines picked up the pace in March. On March 2, Russia handed over Vietnam’s third submarine, HQ 184 Hai Phong, at the Admiralty Shipyards in St. Petersburg. It is currently undergoing sea trials. At the end of the month, Vietnam’s second submarine, HQ 183 Ho Chi Minh City, was delivered to Cam Ranh Bay, while Vietnam’s fourth submarine, HQ 185 Khanh Hoa, was launched at official ceremonies in St. Petersburg. On April 4, Vietnam held an official flag raising ceremony at Cam Ranh Bay for the first two submarines. Indonesia, like Malaysia, has been circumspect in responding to Chinese challenges to its sovereign jurisdiction in its maritime domain. Heretofore unpublicized reports of encounters between Chinese paramilitary ships and Indonesian vessels reveal that the “softly, softly” approach adopted by Jakarta has not resulted in a reduction of Chinese-initiated confrontations. 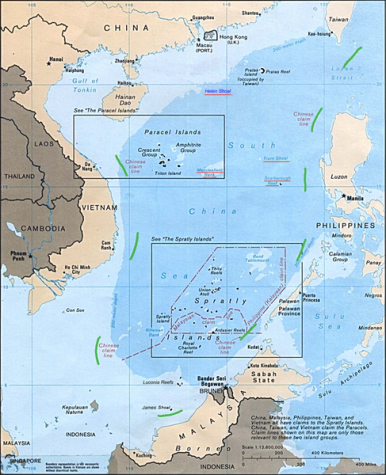 However, China’s increasing assertiveness this year – announcing the right to establish an Air Defense Identification Zone over the South China Sea, imposing a fishing ban on nearly sixty percent of the South China Sea, symbolic claims to sovereignty over James Shoal off Malaysia, blocking efforts by the Philippines to resupply Marines at Second Thomas Shoal, and diplomatic heavy-handedness in response to the Philippines’ submission of its memorial to the UN Arbitral Tribunal – coupled with less publicized encounters with Chinese paramilitary ships, explains why the Philippines, Vietnam, and, most remarkably, Indonesia are pushing back. Rather, China is slowly excising the maritime heart out of Southeast Asia.